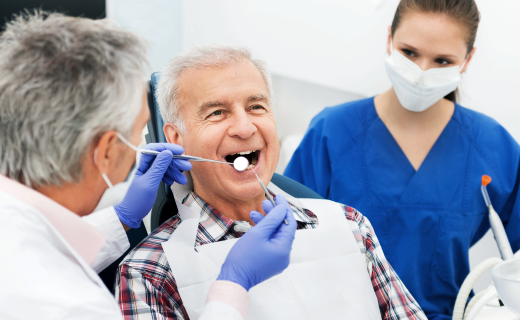 You’re never too old for good oral health, but sometimes seniors are unsure about the best ways to care for their teeth and gums. It all begins with what you learned from the beginning, which is that proper oral care at home and regular dental check-ups are essential at every age. This includes brushing your teeth twice a day with a fluoride toothpaste, flossing daily, and having regular professional check-ups and cleanings. To help you beyond these basics, check out these expert dental care tips to keep your smile great at every age. Aging gracefully is not always easy, but major advances in dental care have made it much more pleasant. Discuss any concerns with your dentist, but be aware of these prevalent problems. Decay and cavities become more common, so it’s important to maintain good dental care at home and have regular cleanings with an affordable dentist. The earliest stages of gum disease are reversible, so get regular oral care check-ups to detect it early. You can lower your risk by eating well, practicing good oral hygiene, reducing stress, and quitting smoking. Sensitivity is likely since gums tend to recede with age. If you experience sensitivity to food, beverages, or cold air, try an anti-sensitivity toothpaste. If it’s severe, see your dentist since it may be a sign of a more serious condition. Tell your dentist about existing health conditions since they can affect your oral health. Dry mouth may be caused by medical disorders and medications. It can damage your teeth, so ask your dentist about treating and preventing the problem. Are some of your teeth damaged or missing? Consider crowns to strengthen them or bridges to replace them. Crowns can be used to support damaged teeth, as well as improve their appearance and alignment. Bridges are used to replace missing teeth. An affordable dentist can discuss your options and give you a better smile.